I love this art activity and think it makes for a great gift OR a fabulous piece to stash away for when you need to whip out something new to keep the kids busy for a while. The best part is that no glue is required. No scissors either. 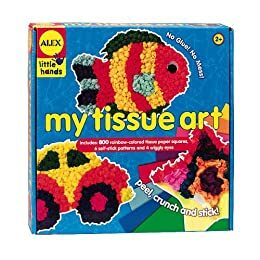 The pictures come with a peel-off adhesive surface and the tissue paper comes in a multitude of beautiful colours, already cut into small squares. As the box says, you really just peel, crunch and stick! I recommend this activity for ages 3+. The box says 2+ but it definitely wasn’t suitable for a two-year old. This week at Toys R Us, you can find this item as well as others by Alex (great company!) for 20% off ($10.37 ea). The promotion is on until Dec. 3rd. Posted in Deals, Gifts, Ideas, sale. This beautiful invitation was created by Erin from Sunny July (another wonderful Etsy find). You can download the PDF file which has printing instructions and print your invitations for free. Click on the page to see a larger image. Lots of great prices…and I’m sure you have a box of Kelloggs cereal in your pantry with a $10 coupon. Prices are good through Dec. 3rd. Thousands of your favorite garments to choose from. Up to 85% off, inventory replenished throughout the day and nothing will be over $50. Free admission. Cash, credit and debit. Fri, Nov 27 and Sat, Nov 28 10am – 9pm + Sun, Nov 29 10am – 7pm. 590 King St. West, Toronto. I know nothing about the line-ups or worthiness of this sale so go at your own risk!!! Posted in Deals, sale, This Weekend. Available Friday, Nov. 27th only! Take digital photos and keep them in a folder on your computer. No piles of paper, but you still have a nice record of your child’s work. Keep 8×10 papers in a binder. Your child will love browsing through their work. Use a large magnetic board (like this one from IKEA). Magnetic clothes pins can be useful too. Display on a large cork board or group a few smaller ones on a designated art wall. You can paint the board or cover it with wrapping paper to give it some umph. Create a photo-book of your child’s work. You can make one at the end of every school year to keep neatly in your child’s library. Last but not least, as in the above photo from Ohdeedoh, you can use Ikea’s curtain wires ($9.99 with clips!) to create this amazing display which I just adore. Posted in Decor, Ideas, Useful Info. Taking place on Sunday, Nov. 29th, 11am-6pm and featuring some of my local favourites: Create-a-Dream children’s bedding, Beauty-N-Nature’s line of organic make-up, The Kids’ Treasure Box and much more. This is a great opportunity to buy gifts for the season. See map for location. Call 416-887-8132 for more information. Posted in Activities & Events, This Weekend, Useful Info. Leave the monkeys at home and go to the One of A Kind Show and Sale. I took my hubby to this show once and vowed never to do it again. A woman needs time to walk through the isles of artisans and unique products and absorb, contemplate and BUY without disruption. Why punish both of you? Kidzfest takes place on Saturday, November 28the and Sunday, November 29th at Yonge-Dundas Square (11am-5pm). This event features two days of winter fun for children aged two and up. The event includes face painting, crafts, live music and guest appearances by Sponge Bob and Harry and His Bucket of Dinosaurs. All of the events are free. Spend an evening driving through Downsview Park’s new Holiday Trail of Lights. The trail features three kilometers of light displays, many of which are animated. $20 per car. My kids are so excited about Christmas lights and we are definitely heading over to check this out this weekend. Visit the Montgomery Inn (Dundas W. & Islington Ave. ) for a Gingerbread House workshop led by Master Baker Monika Paradis for kids of all ages. Each house costs $30. Pre-registration required at 416-394-8113. Toons for Toddlers was supposed to have a feature this weekend but I just read that the movie was canceled and the program will only return in January : ( Shame! Visit the Bata Shoe Museum for their Saturday Shananigans and Paint-A-Clog Sundays. Admission to the museum is FREE every Saturday and Sunday this month with the donation of a brand new pair of socks to the Museum’s “Warm The Sole Sock Drive”. Chapters Indigo Coupon for 25% off! Don’t forget that Indigo has a pretty nice selection of TOYS…unless you have time to read books which sounds nice. I am almost (but not really) ashamed to admit that I have only managed to read 2 books in the past four years. Except baby sleep guides, of course. Click on the coupon to print. Leave the monkeys at home and go to the One of A Kind Show and Sale. Nov. 26th- Dec. 2nd. I took my hubby to this show once and vowed never to do it again. A woman needs time to walk through the isles of artisans and unique products and absorb, contemplate and BUY without disruption. Why punish both of you? Once in a while, you run into a toy that is just awesome. The Boy is 3.5 yrs. old and loves the Scribble & Write by LeapFrog. This is a great learning toy which lets kids practice drawing simple shapes, pictures and upper/lower case letters by tracing a light on a small screen using a stylus. I love it because it is helping him develop so many important skills and he uses it independently. As well, it is portable and can be used in the car, restaurant and airplane…no excess noise and beeps! The price is quite reasonable at $24.99 (Toys R Us & Indigo). I found a number of manufacturer’s coupons which you may want to use if you are purchasing LeapFrog products. These coupons are valid until December 31st and give you $4 off this particular item. This recall involves Stork Craft drop-side cribs with plastic hardware, including Stork Craft drop-side cribs that were sold with the Fisher-Price logo. This recall does not involve any cribs with metal rod drop-side hardware. The cribs were sold in various styles and finishes. The recall includes cribs with manufacture and distribution dates between January 1993 and October 2009. You can find the manufacture date and more product info printed on the assembly instruction sheet that is attached to the mattress support board. Here is some more information from Health Canada. Repair Kits are being provided so you do not need to return the crib. For more information, contact Stork Craft toll-free at 1-877-274-0277. 40% off Fall Collection at MEXX Kids! I find Mexx to be a bit on the expensive side…but am a huge fan of the colour palette and style in their kids’ lines. The whole Fall collection is now 40% off! Lots of great finds. This promotion is on until everything from the Fall line is sold. Go soon for best size selection! This cute printable list (with lines girls, click above to see the PDF) is for the list you plan to give your husband…or kids…because it’s by order of the queen. Courtesy of Heirloom Paperie. Tuesday till Sunday off select styles (meaning, not the stuff you want?). If you go, let us know if it’s worth the trip! Sale on until Dec. 5th. Click here for store locations. Dine.TO is pleased to offer you special discounts at designated restaurants. Some of them are really high-end. These vouchers are offered while supplies last at a 25% discount for American Express® Cardmembers from August 15, 2009 to December 31, 2009. Lots of great restaurants on the list and I must recommend Amaya for Indian food lovers. Educational Toys for Unbelievable Prices! The Kids’ Treasure Box is one of those amazing finds I want to keep to myself and tell you about all at the same time. These two lovely mompreneurs sell high quality educational toys for under $10. Hard to believe, I know! The Kids’ Treasure Box carries a great selection of workbooks, puzzles, toys and games that parents and teachers will love. I just purchased a plastic tub of wooden primary lacing beads ($6) for The Girl and a number of puzzles for holiday gifts. Great educational loot-bags are also available for $3-$5. Call or e-mail for an appointment or visit their upcoming Open House in Richmond Hill (See map) on Nov. 29th, 7pm – 10pm. For more information, please call 416-471-0060. Mamapicks exclusive discount: receive a $10 gift of your choice on every $5o spend when you mention MAMAPICKS! Posted in Cool Products, Deals, Exclusive Discounts. Educational Toys For Less + Mamapicks Exclusive Discount! Go to The Wave Pool (Richmond Hill) or any other indoor pool. Keep the family active and healthy. See a show with the kids – Pinkalicious and Broccoli & Sonshine are great options. Go to Woodbine Fantasy Fair at Woodbine Mall. This is Ontario’s largest indoor amusement park and kids just love it. Enjoy a visit with the usual suspects: ROM, AGO, Ontario Science Centre. Spend the day at Grandma & Grandpa’s house. Invite friends for breakfast and prepare an arts & crafts table for the kids to keep them busy. Can you tell that this is a not-so-exciting weekend in Toronto??? Two years ago, I was on a mission to find the perfect double stroller for my newborn and 18 month old. Last week, at the Babytimes Baby Show, I finally found it. I gasped. How dare they come up with the perfect stroller 2 years too late??? This stroller is coming out in the New Year and is definitely worth the wait (already available for pre-order online at a few US stores). I’ve seen it in action and the thought of having 16 options in one stroller nearly made me cry in a good way. Gift Certificates, namely Tim Hortons, Starbucks, Indigo, and Yorkdale Mall. Please resist buying candles, picture frames, mugs and chocolates….and oh ya, from my own teaching days, I NEVER ate anything baked by a kid. The most important part of your gift is your card – a few personal words from a parent or child letting a teacher know that he/she make a difference fills the heart and recharges the batteries. Yum! No matter how many times people have seen these, they always seem to be a little bit in awe of edible fruit arrangements. Order any product before Dec. 1st (for delivery between Nov. 20-Dec. 31) and receive 10% off. Use promo code EBSP2009. If only I could find maternity pants that would stay put… The woes. Sale runs until Dec. 5th. Check here for store locations. Save $10 on Toy Organizers until tomorrow! Currently on sale for $49.97 until Nov. 19th. Posted in Cool Products, Deals, Decor, sale.